First, Finn decided to practice his strong man skills and pull a barstool down right on his big toe. There was screaming & crying & lots of blood. It left a huge gash, and I was terrified that it was broken. After lots of snuggles & nursing, he finally calmed down only to get even angrier after I dared to put a bandaid on the wound. I think he most unhappy about the damn band-aid. Meanwhile, Liam was at swim lessons with Conor. He did not adjust well to having a new swim instructor, so he refused to get in the pool for lessons. Immediately I knew the frozen treats we had bought "special" were going to have to sit in the freezer for another day. Conor had used them as one big bribe, and it failed. So we had to follow through. I wasn't giving up on my waterpark dreams though. We pulled into the waterpark parking lot only to notice that they had closed early for a private event! What?! On the first of official day of summer?! No way! We decide the next best thing was a splash pad; there is an awesome one with quite the mountain view near our house. So we drove there next. Well it just happens to be right next to an amphitheater, so on event nights they turn the water off early. You guessed it... event night! Literally every plan of mine was spoiled; I was probably more upset than the kids about it. Given our situation, I was still determined to make our evening something special. We headed home to our little backyard oasis. We filled the kiddie pool, turned on the sprinkler & some jams, and were the jolliest little bunch. Moscow mules were mixed. Hamburgers grilled. And we dined al fresco. Liam got to stay up late late late and even spotted the very first star in the sky. It wasn't in the plans, but it turned out darn good. 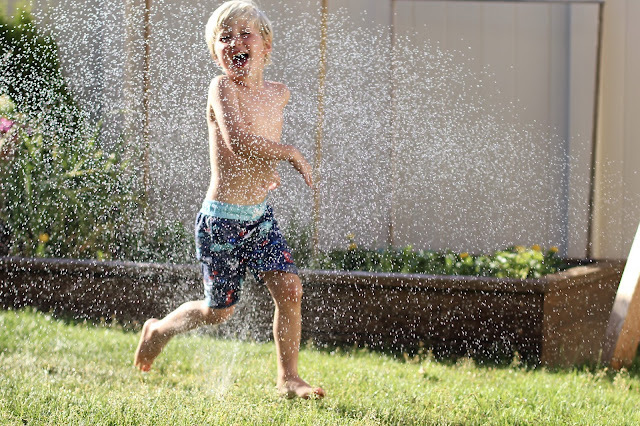 And now I have a new love affair with my camera & our simple sprinkler! Somehow, our little summer solstice celebration turned out alright. I'll cheers to that! We had a very similar first day of Summer! It looks like you really did make the most of it. Beautiful pictures! Great photos. Looks like a great way to end the day after the other issues with the boys. Way to stand your ground with Liam too. That's tough sometimes. That last photo makes it look like Finn is flying and being catapulted by Liam... I love it! And while your day is almost comically disappointing, and you'd never know it by these amazing photos! 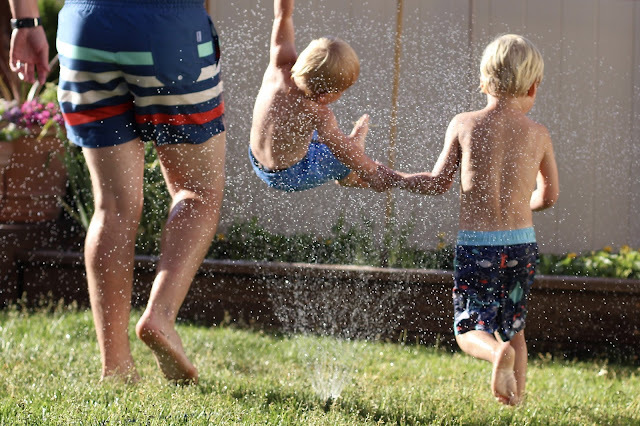 While the water park and splash pad would have been fun, it looks like you saved the day the day with a the sprinkler! Happy Summer! Oh no! One thing after another- but it ended perfectly! Carter had another swim instructor this week too and I was afraid it wouldn't be good but he hopped right in, luckily! You just never know! Love love love the start of summertime! It really is magical! I love everything about this!!! Those spoiled plans don't sound nearly as amazing as how your evening turned out. Such a good mama for putting all the effort in for your boys! Also, can we just talk about Liam's tan for a second! Do ya'll have mosquitoes there? These pictures turned out so awesome! Sounds like it ended up being the perfect evening! Oh- and poor Finner's toe!! OUCH!! Oh my goodness, what a weekend. When it rains it pours, huh? However, it looks like you guys managed to have some fun regardless of everything thrown at you. 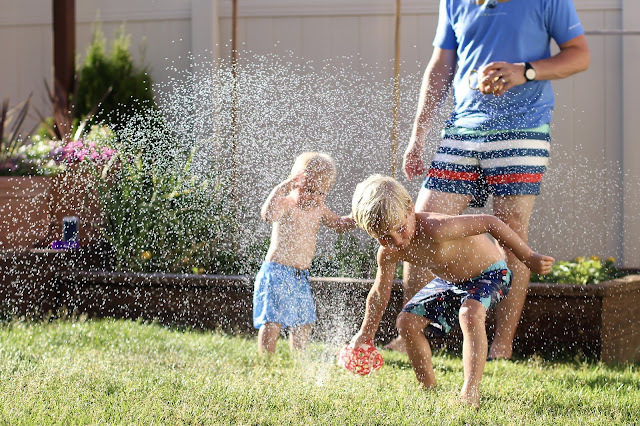 LOVE the shots you got of the boys playing in the sprinkler! Bummer that all of your plans fell through, but I think an evening in your backyard was sweet redemption! These photos are amazing! I recently tried taking pictures of Mason on the slip and slide and it was tough! Want to share your secrets on how you got these amazing shots? Also, hope Finn's toe is feeling better! So frustrating! You know what they say about best laid plans though... But yours seemed to turn out for the better!! I LOVE your photos! What settings did you use? 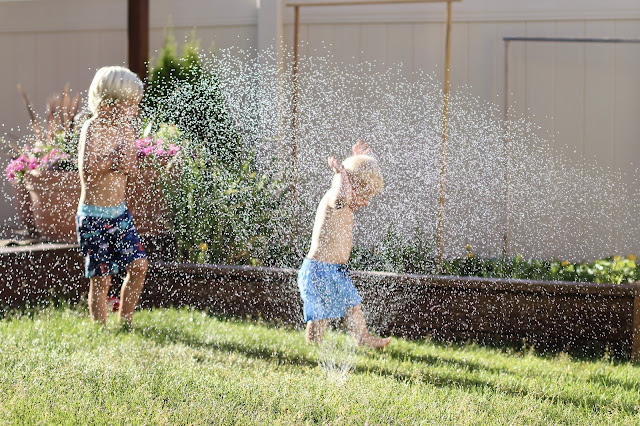 Please share deets on capturing these sprinkler pics..?! 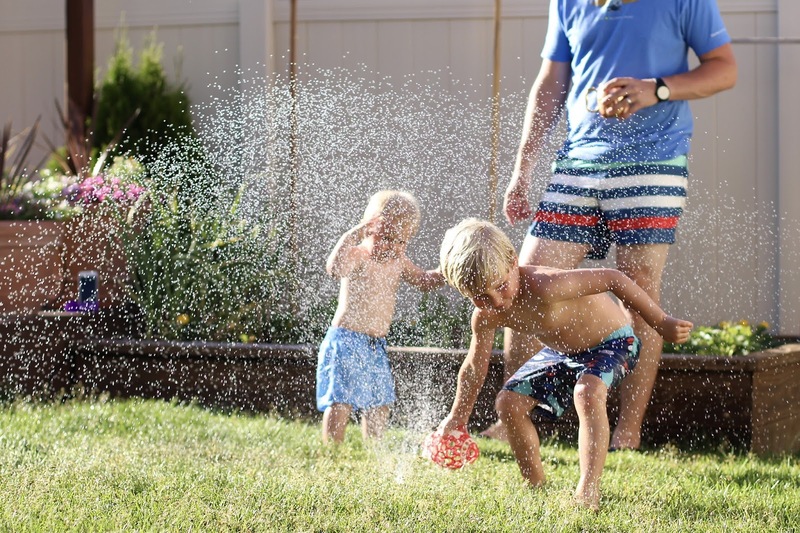 Did you put your focal point on the water/sprinkler? Ahhh you poor thing! It's hard to keep positive when all your plans are crushed like that. So random! But, you definitely turned the evening into a beautiful memory. I agree, there is something magical about the summer solstice. Total bummer on your plans, but it sounds like you guys had a great evening anyway! Isn't that how it works anyway sometimes? I feel like I've had the best laid plans and they all get spoiled and then we do something else and have so much fun (I actually think Mason's birthday last year was like that). Oh man, bummer that so many plans were foiled but at least you managed to have a great time anyways :) We celebrated a day late and went to the park and bought ice cream from the ice cream truck ha ha! Oh I've been there...such a bummer! But it looks like you guys had a great time regardless. LOVE that last picture of Finn swinging through the sprinkler!!! 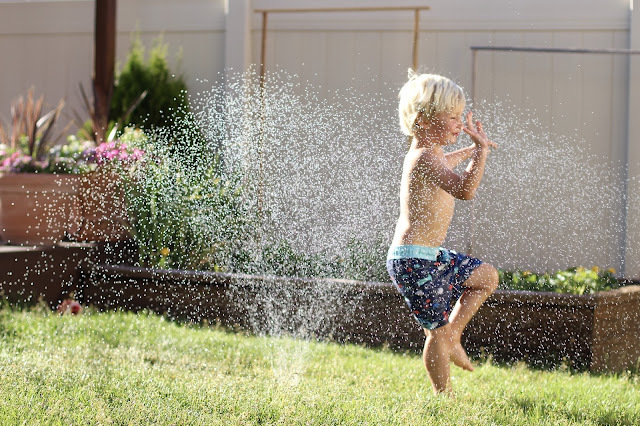 Man I so need to whip out my camera when the sprinkler comes on! Adore these shots! I love even though your plans fell through you still made an awesome night of it! Hope Finn is feeling better today! Even though all of your big plans fell through, it still sounds like the perfect evening!! I want to come over for hamburgers and Moscow mules! Those sprinkler shots are magical! but oh man do I not do well with crashed plans. its too bad all your plans didn't work out, but it looks like the boys had fun in the sprinkler anyways!! !